I was in Berlin for a conference and I just felt anti-social one evening, so I decided to go out on my own and find a restaurant to spend a quiet evening. Uma caught my attention with its Western-Japanese fusion cuisine. The location was very convenient also – it was just on the southern side of the Hotel Adlon Kempinski by the Brandenburg Gate. The decor was impressive, with a Chinese clay horse presiding right in the middle of the restaurant. 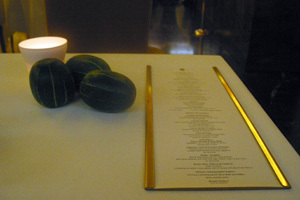 However the restaurant itself was like a death-trap, with the low lighting and the unexpected steps scattered around. There were many choices on the menu to satisfy most people. Some dishes are more South-East Asian than Japanese, but there’s one theme throughout – there’s always a Westernised twist to the dishes. It took me a while to decide what to have, as there were just too many dishes I wanted to try. 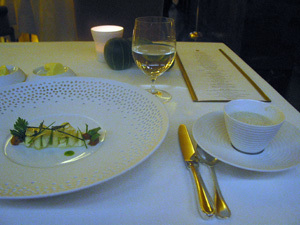 The amuse-bouche was Cucumber Mousse & Lemongrass Foam with Paprika – the mixture of hot and cool (both in temperature and flavour) was interesting: the spicyness of the paprika combined with the coolness of cucumber, covered by a thick layer of foam. My first course was Aubergine with Teriyaki Sauce and Bonita Flakes. When the waitress proudly presented the dish to me, I said to her that I didn’t order the Japanese pizza, but aubergine. She then said “oh really?” Well, yes! Suspiciously enough, my aubergine dish turned up a short while afterwards. The mistake was forgiven as the fish was flavoursome and the aubergine was nicely cooked through. Very enjoyable. The main course was Black Cod with Yuzu and Ginger. The wonderful fragrance of the dish was let down by the uneven cooking of the fish – part of it was too dry while another part was fine. 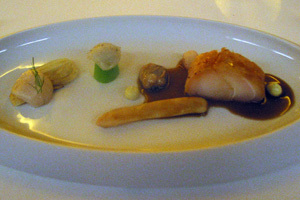 The flavour was also not evenly distributed, resulting in some parts of the fish with overpowering taste. I ordered a bowl of steamed rice to go with the fish – there was a generous sprinkle of sesame on top of the rice which was certainly not Japanese rice – American long-grain perhaps? 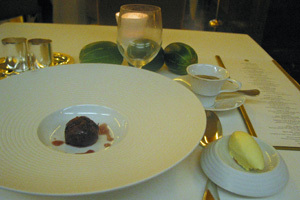 For dessert, I ordered Liquid Chocolate Souffle with Green Tea & Vanilla Ice-Cream. Not really a Japanese dessert in any way, but at least the souffle had a nice gooey liquid chocolate centre. So it was a satisfying finish to the meal. On the whole, the food was good – it was really just been let down by the fish and the rice. Service was good though the attitude of the waitresses could have come across a little less cold – it’s not as if they were rude or anything, just lacking that welcoming friendliness in a Japanese place. It was a cold and damp October evening in Berlin, and I spent ages looking for Margaux on Unter den Linden, without realising that it’s actually off the main road. So when I finally stepped into the restaurant, I was happy to be greeted warmly by the happy friendly staff. The restaurant was airy and spacious, with a somewhat 1970’s feel to the decor. There were a few pumpkins on the table, and as I was dining alone, I was quite happy playing with these little vegs on the table to keep my mind occupied. The chef, Michael Hoffman, is also a gardener and he grows his own vegetables just outside Berlin and supplies them to the restaurant. I decided to just take the plunge and went for the full 8-course set menu “Voyage de Cuisine”. 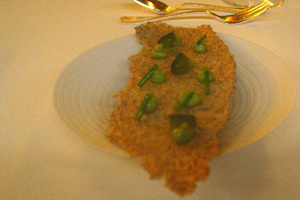 The first amuse-bouche was Crispy Bread, Chive & Cucumber: The bread slice was massive, and the whole piece was an interesting mix of texture of crispy bread, chunks of cucumber and dollops of chive cream. Yoghurt – Whey, Cacao & Wood Sorrel: It was a shame that the restaurant failed to notice that I had not even finished the bread and they brought out the next appetiser. So I ended up with this dish queueing on the table while I was finishing the bread. Again, this dish emphasised on the contrast in texture – the plain smoothness of the yoghurt and parfait combined with the roughness of whey. However, this was not a successful combination in my opinion – the dish was rather non-memorable. 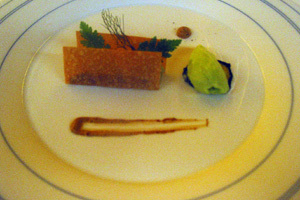 Cucumber – Guacomole & Mole: The cucumber sorbet was pretty refreshing, and worked well in combination with the delicate flavour of the crispy wafer and guacamole. 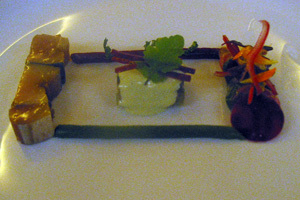 Mackerel, Salad & Beetroot: Mackerel cooked in jellied fond of veal; Soubise of parsley, herbs and beetroot; Grilled salad in vinaigrette, French dressing: The beetroot and other vegetables were very thinly sliced and arranged beautifully on the plate; however, some tough skins on the mackerel ruined the overall experience of this dish. 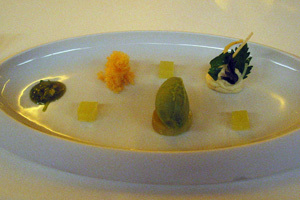 CELERY 1: Sea Urchin, Celery & Seaweeds: Celery cooked in sea salt with celery gnocchi and celery cream; Glazed bar celery and almond oil; Emulsion of sea urchin; Marinated seaweed with sea urchin and lemon. 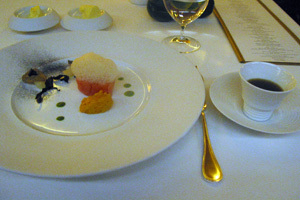 After the rather hurried service between the first two appetisers earlier, it was a very long wait before this course arrived. The staff even noticed that I was about to fall asleep at the table and apologised for the wait. The seaweed, candied lemon and sea urchin were combined to create an interesting mix of flavour, although this was overpowered by the strong intense taste of the emulsion of sea urchin, which looked like a rather creamy mushroom soup. 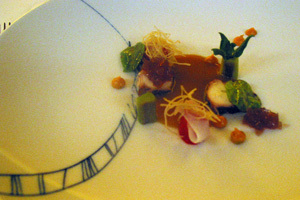 Pepper & Sepia – Caramelised leek, steamed spinach; Grilled cuttlefish, marinated sepia; Sauce of vegetables – confit: This dish was colourful and beautifully presented to the table. While the leek was not as caramelised as I had expected, overall the dish tasted as good as it looked, and there was a pleasant after-taste. Salmon Trout & Autumn Flavours – Pumpkin, watercress, black chanterelle, salsify, chestnuts; Apple and horseradish, bouillon of fruits: Interesting colours on the plate, though it was not as enjoyable as I had hoped – the apple and horseradish foam sitting on top of the fish was an unnecessary extra, and the pumpkin mousse and the watercress mousse, while flavoursome, could have been shaped better – they looked as if they had been dropped onto the plate, followed by a dusting of black chanterelle. 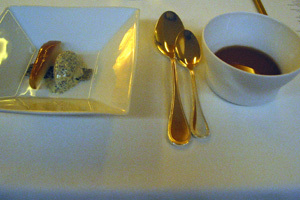 The bouillon of fruits was very strong and salty – with the flavour resembling more of a beef bouillon – totally masking the taste of the main dish. 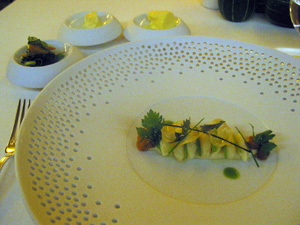 Codfish & Shellfish – Codfish, marinated with fennel; Marinated shellfish with fennel and pumpkin; Cream of codfish and olive oil: The codfish was cooked in 50C and finished off with a glaze using a blowtorch – while some fish worked well with this method of cooking, this was not one of them – it would have worked better with normal pan-roasting with this texture of fish. The scallop and pink shrimp were ok, but the razor clam was rather chewy. 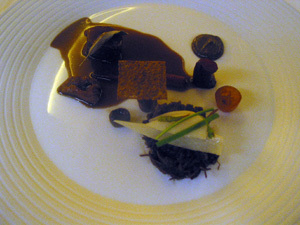 Hare & Turnips of Teltow Farmers – Interpretation of “Sauerfleisch” and poached in nut butter; Pickled dried fruits and pumpernickel; Glazed Teltow turnips and steamed Crapaudine; Jus with yeast flavour and apples vinegar: Unlike other turnips, Teltow turnips were long and thin, with a purple flesh colour. It’s grown in the region of Teltow just south of Berlin. This dish was very salty, to the point that I had to order another bottle of water just to wash it down. CELERY 2 – Celery, Apple & Red Leicester: Cream, salad and ice of celery; Apples – jelly and sous vide; Grated red Leicester – After the previous course of ultra-saltiness, this dish was a welcoming change, with the rather refreshing celery ice and a richer cream flavour to balance it out. The Granny Smith apple provided the sharper cut to the flavour, and the Red Leicester cheese complimented well, elevating the overall taste of the dish. The first one was a slice of poached pear with a very concentrated pear jus, accompanied by poppy-seed ice-cream with biscuit. Unfortunately with the ice-cream sitting right on top of the biscuit, the biscuit turned rather soggy. It was OK but not a great dish. 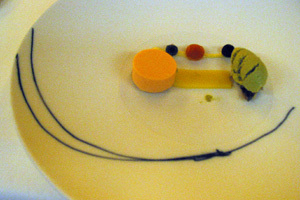 The second dessert was pumpkin mousse and pumpkin sorbet with olive and orange on the side. While I would not have imagined this worked well, the sharper olive and the citrus orange flavour actually went well with the blandness of the mousse and sorbet. 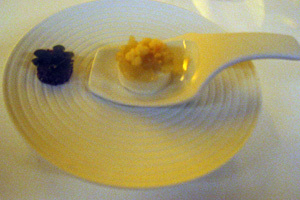 The third dessert to finish off the journey was poached red peach with almond paste and vanilla and lavendar ice-cream. By this time I was already pretty full, and this dish was pretty heavy. So I didn’t really enjoy it too much. 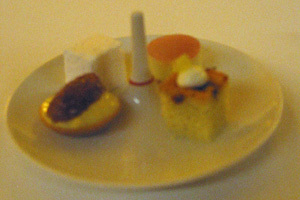 The petit fours were all made from a grape or champagne base. On the whole, this meal was an interesting experience. The use of flavoured oils rather than butter and cream for the dishes in order to retain the flavour of the vegetables, and the sourcing of the local vegetables to reduce the carbon footprint, was to be congratulated. However, the flavours could be a bit of a hit-and-miss affair, with some dishes being so salty and some verging on total blandness. Was it worth the price tag of €180 for eight courses (well, ten, if you counted the desserts separately)? Personally I don’t think so…..